Pesarattu is one of the specialties from Andhra, in South India – usually had a breakfast dish. In fact, it is one of the identities of my native state. 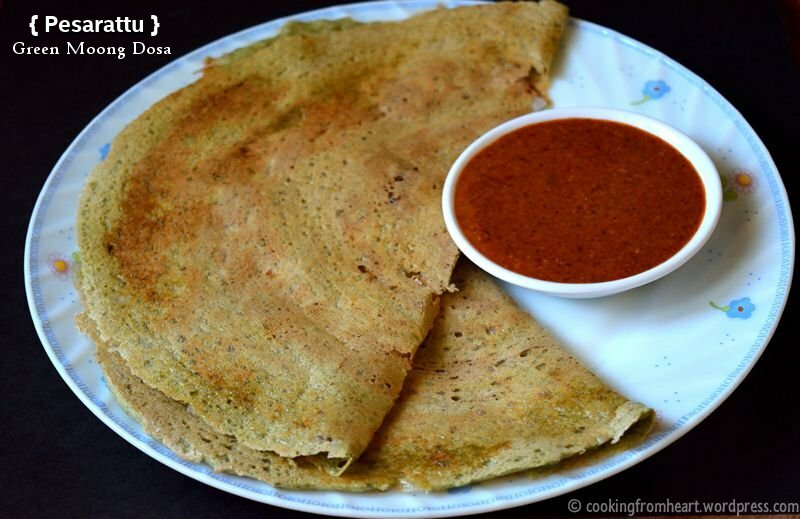 There are a number of ways this crisp green moong dosa can be made and the recipe is quite simple. 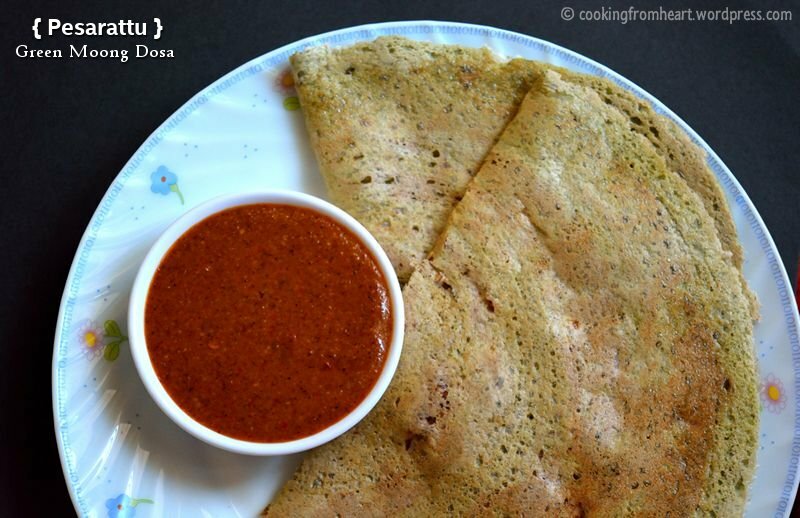 In Telugu (the native language of the state), Pesarattu means Attu (dosa) made from Pesalu (Green Gram/Whole Green Moong Dal). 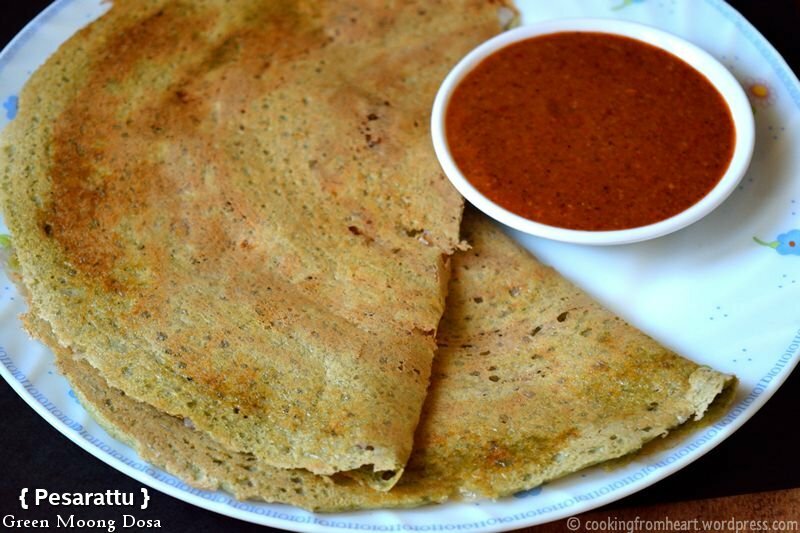 So a recipe where the green moong has been used to make crispy dosas is called Pesarattu. 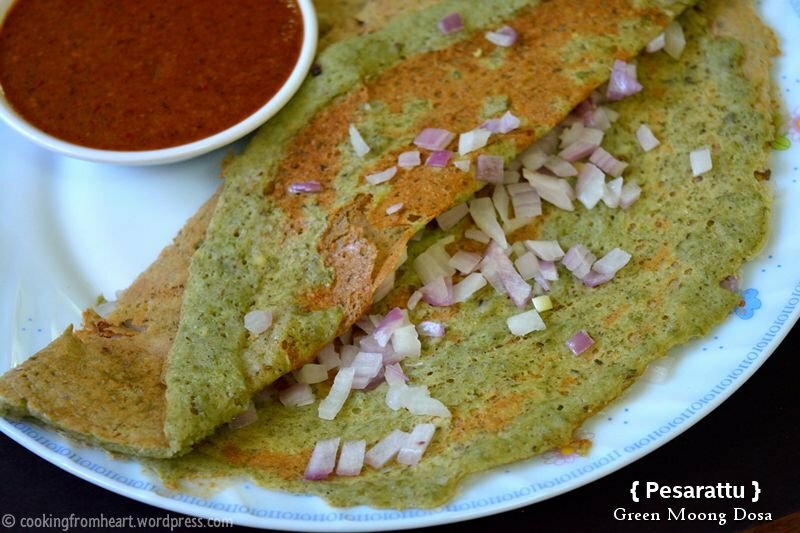 This is a recipe from my Amma’s kitchen and the preparation of pesarattu is quite simple – soak whole green gram/split green gram along with a handful of rice in enough water for 4-6 hours. Grind it into a smooth batter. Make pesarattu right away- that’s the best part about this recipe. No fermenting time or waiting time. The most usual way to make a Pesarattu is by topping it up with finely chopped onions and with a side of special ginger chutney (Allam Pachadi) – look out for the recipe tomorrow. For people like my uncle who love spicy food (another identities of most Telugites), they add finely chopped ginger and green chillies on the pesarattu too. Yet another classic combination is to have Upma – Pesarattu (Recipe coming soon!). It may sound weird but it one of the tastiest dishes that we people from Andhra make (even if it sounds like I am bragging 😀 ). Do check out my Allam Pachadi/Ginger Chutney recipe tomorrow to prepare this classic combo at home. 1. In bowl, wash and soak the whole green moong/pesalu with enough water for 4-6 hours. Drain the water and blend into a smooth paste after adding the ginger, green chilly and jeera. Add required salt and mix well. The consistency of the batter should be slightly thicker than the dosa batter. 2. Heat a flat iron or dosa tawa. Take a ladle of this pesarattu batter and spread it thin on the dosa tawa. 3. Top the Pesarattu with finely chopped onions. Sprinkle some oil on the sides. Let the Pesarattu cook on medium flame until golden brown spots start to appear on it. 4. Fold the Pesarattu in half and carefully remove it on the serving plate. Adding a handful of raw rice gives the crispness to the Pesarattu. It is however optional. Adding ginger, green chilly and jeera while making the batter is essential and adds to the taste. Also ginger and jeera help in digestion. The batter doesn’t have to ferment. Pesarattu can be made immediately. The batter stays good in fridge for about a week. Do not make the batter too watery as it would be hard to make Pesarattu. It’s important to cook this Pesarattu on medium flame to get crispy Pesarattu. In addition to the finely chopped onion, finely chopped ginger and finely chopped green chilly for a spicier version. Additionally, butter can be spread all around the pesarattu, instead of oil to make Butter Pesarattu. Wish I could hand you one too! Thanks Lynn! Yummy and healthy. I prefer it with onions too.